Just last month, it was announced that Zachary Levi, known for his work in “Chuck” and the voice of Flynn Rider in “Tangled,” would produce and star in a new musical sitcom entitled “Tuned,” which has presumably been picked up by NBC. The show will profile a successful New Yorker, played by Levi (whose world is often interrupted by musical hallucinations), and it will be filmed with a single camera. Now, if you’re like me, your first thought was, “Really?” It seems like NBC has been trying to garner a new audience with the impartation of musicals into their line-up lately, and there is definitely something to be said for taking the risk. Nevertheless, NBC had a huge flop on its hands with “Smash,” their first attempt at prime time musical theatre television. The hour-long drama only lasted for two seasons, and it may have garnered most of its criticism from theatre actors themselves. The music was well written and catchy, and the actors were fantastic, but I mean, come on. Are the biggest Broadway producers truly likely to take a seat at one of the red tables by the TKTS booth in the middle of Times Square? I’m going to go with no on that one. But there are other points of interest to be considered here. Think about the success of “Glee.” Interest in the show has pretty much tapered off, but at its start, “Glee” was extremely popular. It was marketed as a musical comedy, although there were definitely episodes that tugged at viewers’ heartstrings. I watched it for three seasons myself before the characters started writing original raps about how much they loved New York City and Sue Sylvester married herself… They kind of lost me after that. But hey, at least they tried, right? So, herein lies the question: are musical television shows less successful when they are marketed as dramas? Take the musical episodes of two popular, medical-themed TV shows: “Grey’s Anatomy,” a drama, and “Scrubs,” a comedy. I’m a pretty die- hard Grey’s fan myself (Go Shonda! ), but the musical episode that was produced during the show’s seventh season definitely left something to be desired. The “Scrubs” episode, however, was a huge success among its fan base. Could we attribute the lackluster response to the Grey’s episode to the fact that it was a drama and not a comedy? Tony winner Sara Ramirez’s voice definitely isn’t cause alone for a bad response — she’s just about as fierce of a beltress as one can be — so what’s the deal here? An example of this can also be seen with Disney’s popular “High School Musical” franchise. Troy actually sang a song in his head at basketball practice, and all of his teammates joined in. Musical hallucination? Yes. Comedy? Yes. Family oriented? You bet. Good job, Disney. They’ve been doing it right since the 2000s (the Even Stevens musical episode, anyone? Pure gold!). This also raises questions regarding family orientation and the success of NBC’s first live-staged televised production, “The Sound of Music” last December. NBC was smart with this one; they knew exactly how to appeal to a wide variety of audiences. They hired American Idol winner and country superstar Carrie Underwood to play Maria, which gave NBC the ability to reach an entirely different audience than they would have had they hired a Broadway star. However, they still remained true to their die-hard theatre viewers, and cast favorites like Laura Benanti, Christian Borle and the Queen of all things Broadway, six-time Tony Award winner Audra McDonald. “The Sound of Music” garnered 18.5 million viewers, and they’re about to attempt the same feat this December with a live-staging of “Peter Pan.” So does a family oriented, seminal classic musical make a difference in success? I’m positive that it does. And I hope that “Tuned” garners the same success. Although NBC has produced a number of utter flops lately (sorry, “Sean Saves the World”), I can’t help but note that shows like “The Office” and “Parks and Recreation,” also filmed with a single camera, have been extremely successful. Maybe it’s the fact that people associate musicals with comedy. Many people just don’t go to the theatre to see something emotional anymore, they want a spectacle. And whether or not I agree with this is a story for another day. But there’s something to be said for the idea that musical dramas don’t work because the people who watch these shows on TV aren’t interested in hearing someone sing a ballad about their drug addiction. 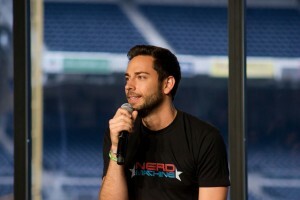 Good luck, Zachary Levi and NBC. May the musical force be with you. ← “Homeland” season four: A new moral compass?